Social media giant Facebook has deleted accounts used to organise ‘yellow vest’ protests which have seen MPs verbally abused outside of Westminster. 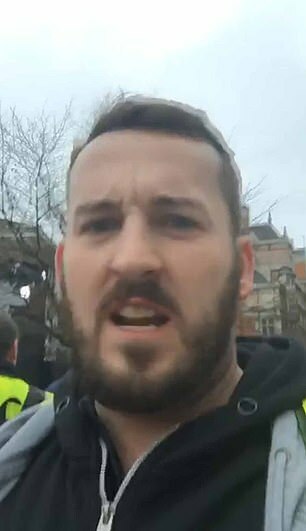 Far-right rabble-rouser and protest organiser James Goddard’s Facebook profile has now disappeared amid calls for police to prevent the group from ‘harassing’ politicians, journalists and pro-EU demonstrators. Mr Goddard’s PayPal account is also understood to have been disabled. The 29-year-old had used Facebook to call the protests which have been taking place over the last month across UK cities. A spokesperson for Facebook said: ‘We have removed James Goddard’s Facebook pages and groups for violating our policies on hate speech. We will not tolerate hate speech on Facebook which creates an environment of intimidation and which may provoke real-world violence’. Following the deactivation of his Facebook account, Mr Goddard wrote on Twitter that Facebook had ‘silenced him’. He also posted a link to his PayPal account, which was then un-accessible a few minutes later. Mr Goddard, who verbally abused Anna Soubry is a vocal supporter of Tommy Robinson and Donald Trump and has previously asked for online donations to support his ‘yellow vest’ campaign. Mr Goddard, from Leicester, had denied the Tory MP was verbally assaulted when he called her a Nazi – but says she ‘deserves’ a barracking for treating him and others with ‘contempt’. It comes amid claims his followers are planning a wave of protests across British cities including Birmingham and Manchester this weekend copying the style of the recent violent demonstrations across France. The protests could even target the offices of Remain-supporting MPs. On Monday Goddard also abused Owen Jones, branding him a ‘Communist bully’ and a ‘lying little toad’ whose ‘parents must be ashamed’. As people called for Goddard and his supporters to be arrested he said he ‘has nothing to apologise for’ and said he has a right to abuse MPs. Since December the professional protester has been outside Parliament where he has barracked MPs and journalists and also visited the ‘treacherous’ Labour Party’s offices in central London. On his Twitter and Facebook accounts he encourages supporters to donate to him and ‘support my work’ via a PayPal account. The 29-year-old from Leicester says that Halal meat should be banned and that no new mosques should be built in the UK to avoid Britain becoming a Muslim country in 50 years. Trump supporter Mr Goddard also claimed terror attacks were being covered up by the UK Government. Anti-fascist campaigners HOPE not hate said it had seen messages shared among British ‘yellow vests’ planning protests in Cardiff, Birmingham, Manchester and Leeds this weekend, with Remainer politicians likely to be targeted at their offices. The anti-racist group also accused Goddard and his followers of being ‘far-right extremists’ who are being co-ordinated by civil rights group Liberty Defenders – although the organisation denies any affiliation with the yellow vests. HOPE not hate also claims former BNP leader Nick Griffin is supporting the protests to ‘resurrect his political career’. MailOnline has contacted Mr Griffin for comment. 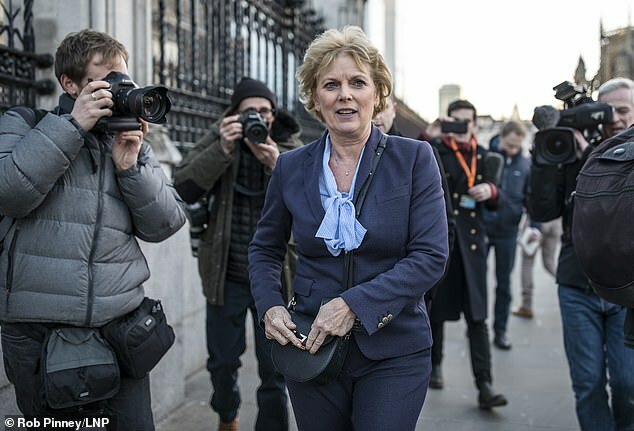 Police near Parliament have been ‘briefed to intervene appropriately’ if the law is broken after Tory MP Anna Soubry accused them of ignoring abuse hurled at politicians and journalists. The pro-EU Tory made the allegation the day after she was branded a ‘Nazi’ and a ‘liar’ by a mob who targeted her during live television interviews and then followed her as she made her way back into the Commons. Today Metropolitan Police Deputy Assistant Commissioner Laurence Taylor said: ‘An ongoing policing operation at the Parliamentary estate around Brexit continues and we have an appropriate policing plan in place. ‘Our role is to facilitate peaceful protest and balance the needs and rights of all those present, including protesters, MPs and members of the public. ‘We will deal robustly with incidents of harassment and abuse against anyone where that harassment or abuse constitutes a criminal offence. Nick Lowles, HOPE not hate chief executive, said: ‘The British far right are attempting to copy the French ‘yellow vests’ protests in order to stir up trouble and harass, threaten and attack their political opponents. ‘The appalling abuse faced by Anna Soubry MP, Sky News presenter Kay Burley and campaigning journalist Owen Jones are simply the latest incidents in a growing list of far right actions across the UK. ‘With the Brexit clock running down, the threat from the far right is growing and the risk of disorder and violence is on the rise. ‘While everyone should be allowed to protest peacefully, it is time for the authorities to clamp down on the bullying and threatening tactics used by these extremists before someone is seriously injured. In a statement on its website, Liberty Defenders distanced itself from the abusive protests. The statement said: ‘Liberty Defenders are NOT affiliated with the Yellow Vests or any other political pressure movement regardless of the lies purported by certain members of the establishment media. ‘We merely objectively reported on the recent protests due to the decorated veterans involved. ‘All of our activists are independent, care for veterans rights and love this country first. The organisation is led by former soldier Timothy Scott, who was once leader of the UK branch of the ‘Patriotic Europeans Against the Islamisation of the Occident’ (Pegida) but who resigned after a ‘car crash’ interview on Channel 4 in 2015 when he was questioned on the exact threat of radical Islam to the UK. Last year Goddard railed against ‘the establishment’ and called them ‘satanic paedophiles’ when speaking at a rally for the ex EDL leader Tommy Robinson in the summer, after he was jailed for contempt. Mr Goddard is also at the forefront of the newly established so-called British yellow vests movement. The group wear high-vis yellow jackets in an effort to copy the look of the Gilets Jaunes protest movement in France. 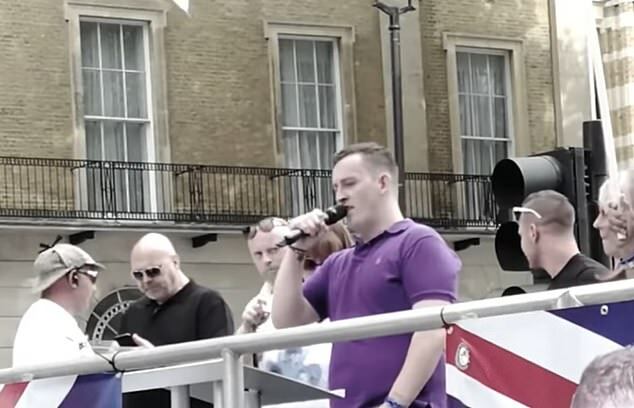 He gleefully films video clips of himself heckling and shouting at police and MPs, who he brands ‘traitors’, and then posts them on his Twitter and Facebook pages for his thousands of followers to see. Yesterday, he and his fellow protesters surrounded and barracked MPs and journalists who had been giving interviews on College Green near Parliament. They angrily chanted that Tory MP Anna Soubry was a Nazi before following her all the way back to Parliament shouting abuse at her. The same day they mobbed Guardian columnist Owen Jones – hurling abuse at him and branding him a traitor. But Mr Goddard revels in the notoriety his abuse gives him, sending tweets gleefully linking to news articles about him.